What is a Connecticut Promissory Note? Connecticut Promissory Note: What Is It? A Connecticut promissory note is an agreement between a borrower and a lender that involves repaying a loan that was given. Promissory notes are either secured or unsecured. A secured promissory note includes the promise of collateral that will be provided to the lender if the borrower defaults on the loan. An unsecured promissory note means there is no collateral. If the lender is not paid as promised, they have to sue the borrower if they want to try to gain a judgment. Various Connecticut laws regulate promissory notes. Secured notes are often treated as a security document. Contract law and usury law that also apply. The maximum amount of interest that may be charged in Connecticut is found in the state’s usury law. Connecticut Title 37-4 states that the maximum amount of interest that may be charged on a consumer loan is 12%. Lenders who charge more than this maximum amount may face prosecution by the State of Connecticut. The date of creation. This should be formatted as month, day, and year. The full legal name and mailing address of the borrower. 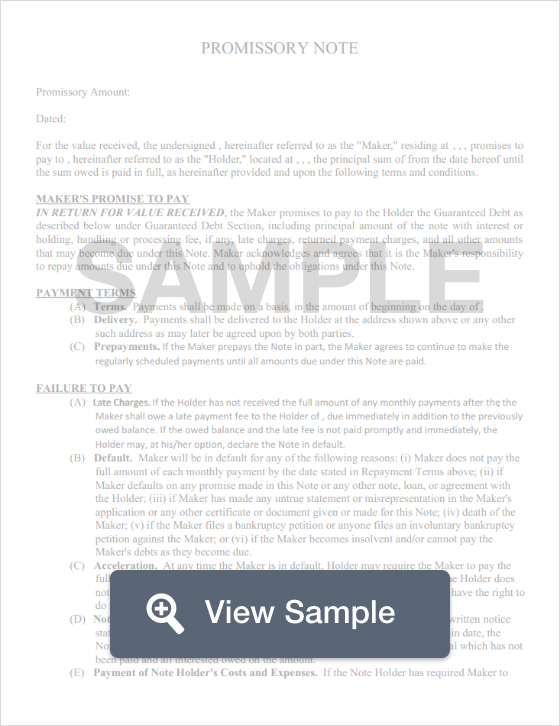 The promissory note should also indicate that the named individual is the borrower. For example, Jane P. Doe, Borrower. If the promissory note is secured, include the physical address of the borrower. This could be helpful if the collateral must be retrieved because the borrower defaults on their payments. The full legal name and mailing address of the lender. The person or entity should also be denoted as the lender. For example, Susan Jones, Lender or Jones Auto Financing Inc, Lender. The principal loan made to the borrower. This is the amount that the lender agreed to provide to the borrower. It is important to ensure that the number listed within the promissory note is accurate and is only the amount loaned. Interest is addressed on its own. The amount of interest charged on the loan. Usually, this is listed as either yearly (per annum) or as the APR (annual percentage rate). The highest amount of interest that may be charged in the State of Connecticut is 12%. Payment Information. The majority of Connecticut promissory notes are satisfied through installment payments. This is a certain amount of money paid on a weekly, biweekly, or monthly basis for a certain amount of times. Those terms, as well as the amount of the payment, should be defined within the promissory note. If the lender charges a late fee, the amount of the fee should be listed as well as when the late fee will be assessed. For secured Connecticut promissory notes, identifying information about the collateral should be included. Without this information and a proper title, the court may hold that the promissory note is unsecured. Interest Due in the Event of Default. This clause clarifies the interest rate that the borrower will have to pay if they default. Payment Allocation. This explains how the payments received will be split between the principal balance and the interest. Prepayment. Prepayment means that the borrower wants to pay off the loan earlier. A prepayment clause explains whether the borrower will be penalized in some way for paying off the loan before the end of the finance period. Acceleration. Acceleration is the process of the lender demanding that the borrower pays off the remaining balance immediately because they violated the terms of the repayment agreement. This clause explains the lender’s right to do that. Attorney Fees and Costs. If a dispute occurs over the promissory note, the clause explains how attorney fees and costs will be addressed. The most common ways include the borrower and lender paying their own costs and fees and the borrower paying the fees and costs assessed by the lender if the lender wins the lawsuit. Waiver of Presentments. This clause explains to the borrower that the lender does not have to be physically present for payments to be made. Severability. The purpose of the clause is to state that if any part of the promissory note is unenforceable, the rest of the note is still enforceable. Conflicting Terms. This clause is used to explain how conflicting terms will be handled. This is generally done through the creation of an amendment. The amendment clarifies the conflicting terms and governs the agreement. Notice. This clause explains whether the lender will provide legal notice to the borrower if the lender sues them for default. Governing Law. This clause explains which state will govern the agreement. A promissory note does not need to be witnessed or notarized in Connecticut. It does need to be signed and dated by the borrower and the lender.